America is in the grips of a lime shortage. Problems with the Mexican lime crop -- plagued by severe wind and rain, bacterial disease and criminal cartels -- are squeezing supply. Bars and restaurants are grappling with higher prices on the tiny green citrus fruit. Margarita and guacamole profits are in danger. Some airline passengers are struggling to get a wedge for their drinks. At the grocery store, the fruit could set you back about $1 per lime, versus just 29 cents a year ago, according to U.S. Department of Agriculture data. But it didn't have to be this way. We could all be enjoying cheap, delicious limes from Florida right now, if not for a government program that virtually destroyed our domestic supply of limes more than a decade ago. The blue line shows how the average retail price of limes has spiked over the past few months, according to the USDA. In 2000, shortly after the South Florida lime industry had recovered from Hurricane Andrew, terrible, large bumps started appearing on limes, forcing them to fall off the trees before they were ready for picking. The problem was a disease -- not harmful to humans -- called citrus canker. State officials worried the canker would spread north to the state’s $8.5 billion orange and grapefruit industry. The state forced growers to kill any trees within 1,900 feet of an affected tree. The 1,900 foot rule came from a controversial study that officials refused to release until Miami-Dade and Broward Counties sued to stop the eradication program, according to a Miami Herald article at the time. “Within 10 months, most of the lime acreage had been pushed and burned,” said Jonathan Crane, the associate director of the Tropical Research and Education Center at the University of Florida. As a result, Florida went from producing about half of America’s limes to almost none of them. Now, we get something like 95 percent of our limes from Mexico, and the quality probably isn’t as good, Crane said. When a sizable share of our limes came from Florida, they had to meet strict quality standards, as did their competitors abroad in order to gain import into the U.S. 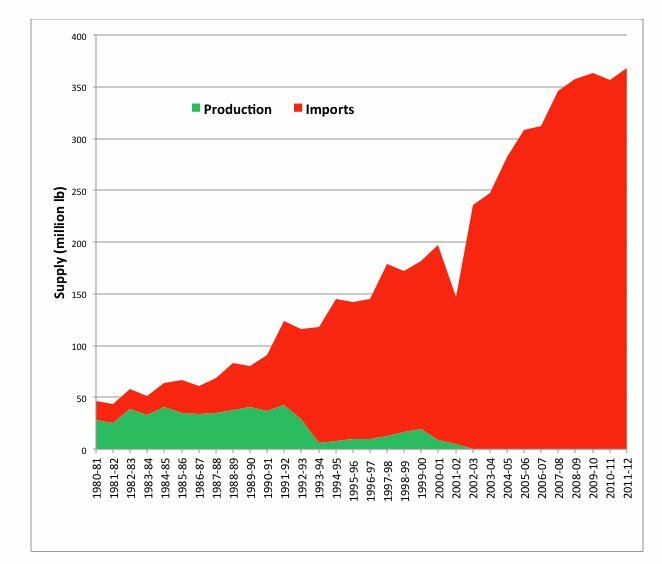 This chart from a paper by Crane and his colleagues, Edward Evans and Fredy Ballen, also of the University of Florida, shows how the number of imported limes rose as U.S. lime production dropped. These days, growers in Mexico have resorted to pulling limes early from trees to protect them from criminal gangs looking to take advantage of the high prices and to capitalize on the price hike themselves, according to David Karp, a researcher at the University of California-Riverside. “Growers are harvesting the fruits when they’re very young, and they’re smaller,” he said. Don't expect lime production to come back to the U.S. anytime soon, though. Citrus growers in Florida and California aren't so eager to enter the business: Lime profit margins are typically pretty low, and they're considered a risky crop. Also, it's unclear if Florida could have ever kept up with the demand for limes -- margaritas and guacamole have increased the fruit's popularity over the past decade or so. Until lime prices settle back down -- Crane predicts the Mexican limes will recover in four to five months, making them more plentiful -- restaurants and bars are trying to cut back, subbing lemons if possible. Still, no one wants a lemon margarita. Most bar owners probably have to eat the cost for now, said Karp, who also writes about farmers markets and produce as a columnist for the Los Angeles Times. But stay calm, at least one major burrito joint says it still has enough limes for its rice, guacamole and salsas. Tracy Kahn, the curator of the University of California-Riverside's Citrus Variety Collection, said that in addition to environmental factors, one thing contributing in part to the lime shortage is Americans’ insistence on using specific citrus for specific purposes when others would do just fine. "As a society now, we think that we should be able to have everything all the time, and that's sort of unreasonable," Kahn said. "We've also gotten narrow in the regard that we need this kind of citrus for this and that kind of citrus for that."